HOW DO I MAKE A RESERVATION? You can make a reservation by calling us at (281) 442-0907 from Monday through Friday from 9 AM to 7 PM, or Saturday and Sunday from 9:00 AM to 4:00 PM. If we don’t answer the phone the first time please try again or leave a message, we will surely get back to you as soon as we can.WHAT ABOUT THE DEPOSIT? $50 deposit is required! Your full rental balance is due upon delivery.HOW CAN I PAY FOR MY RENTAL? You pay for your rental at the time of delivery. Our forms of payments are cash. We don’t accept credit cards at this moment. are for the entire day, which means we can offer it before until one hour before the start of the meeting and can be stored until 8:00 pm only apartment. Parks have the 6.00 pm. Home “Rents for all day”. 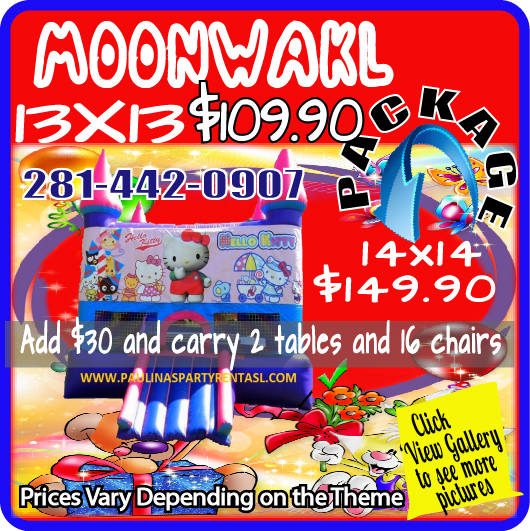 We charge $ 35.00 If you want to keep your night inflatable. The only requirement is that it be in a safe place, because you are responsible for your computer. Note: To rent for a park, make sure you have electricity in the park, or have your own generator. Rain on the day of your party is already bad and the last thing you should be worrying about is us! So we’ll give you a call in the morning and we will ask you if you prefer to reschedule your rental or if you want to cancel the delivery. Unfortunately we can’t give you a refund if it rains after we have already setup the equipment. HOW SOON SHOULD I MAKE MY RESERVATION? Please make your reservations as soon as possible. The sooner you call, the more likely you are to be able to obtain the item you want. Make sure you have electricity in the park or have your own generator. Each item has its own specifications sheet, so be sure to check that for specifics instructions. However, in general terms approximately a 20′ by 20′ area should be plenty of room for most bouncers and a 20′ by 38′ area for slides. The area should be level, free of rocks, sticks, etc. and any in ground sprinkler systems should be shut off and not sticking up. The unit must be within 50 feet of an electrical outlet. Our inflatable rides can also be used indoors. Please specify which surface the inflatable is to be set up on, so that we can provide the appropriate anchors. Please clean and clear the area for the inflatable prior to our arrival time. You should call us immediately if you think you may cancel at 281-442-0907 . Simply leaving a message or sending an email is not enough to cancel a reservation, so make sure that you talk to one of our representatives. You will receive a confirmation email upon your cancellation to verify we have made the changes on our end. If you are calling to cancel on the day of your party, please call before 8:00 AM so we can inform the drivers not to load your equipment. Our company charges applicable taxes for the state of Texas in the amount of 8.25%. If you are tax exempt, please fax a copy of your tax exemption form to paulinaspartyrental@yahoo.com after we have confirmed your reservation. Please include your invoice number on the form. We will deduct all taxes only after we receive this form. We set up the bounce or slide and take it down when we come to pick it up. This is done to ensure your safety and the safety of the equipment. Set up time is approximately 15-20 minutes for the bouncers and 20-25 minutes for slides. We ask that if you are done with the bounce or slide please DO NOT shut down the blower. The bounce or slide must be inflated before it is taken down so that we can inspect and possibly do a preliminary cleaning of the unit. We ask that if you use the slide as water slide that you turn off the water and empty the pool one hour before we arrive, but leave the unit inflated, so that it may be dry when we pick it up. This hour will not be included in your rental time. You decide the rental time and we will be there anywhere from 30 minutes to 3 hours before to configure. You pay nothing for creating or taking downtime. The rental period is for the day. You decide what time you want to leave and we will pick up at any time to 21:00. Other time, and set overnight ups are available for a minimal additional charge. We pick up the unit after the party is over, Apartments thru 8:00 pm, Parks pick up 7.00pm. If you need an accurate delivery or pickup time, just let us know. We will be more than happy to make any arrangements you may need. We do our best to accommodate all customers in times of unforeseen weather and/or emergency conditions. Besides it’s not your fault it rains on the day you wanted to have a party. We are proud to say that there is no penalty for rescheduling or cancelling a reservation due to rainy weather. We setup the unit and inflate the bounce or slide with a fully enclosed blower motor that must stay on the entire time that the inflatable unit is being used (unless winds exceed 25 mph or it starts to rain, in which case the motor must be shut down). There are no moving parts exposed on the blower unit, which is a very important safety feature when there are children around. The blower unit must be located within 50 feet of an electrical outlet. If it’s raining hard, our drivers are instructed to contact our customers on the morning of their reservation to confirm delivery. If you decide to reschedule, that is fine by us. Do understand however that sometimes rain may be occurring in one town but not the town right next to it, and it might only last a few minutes. For this reason, we deliver all reservations as scheduled. If a verbal acceptance of the delivery is given over the phone on the morning of the delivery and the customer declines the rental when the driver gets to the rental location, the customer will be responsible for payment of the moonwalk. 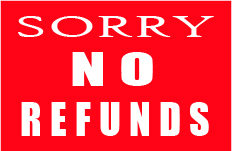 We also do not give refunds after we have setup and left equipment. 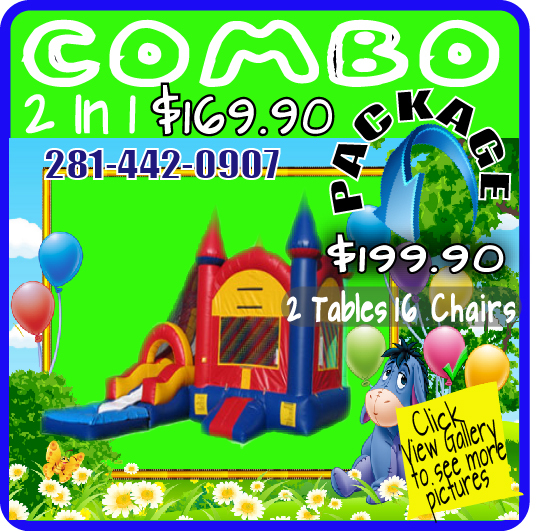 THE INFLATABLE BOUNCES MUST NOT BE USED IN HEAVY RAIN, OR WHEN WINDS EXCEED 25 MPH! THIS IS A VERY IMPORTANT SAFETY ISSUE! If it starts to rain and the inside of the bouncer gets wet, everyone should exit the bouncer, the blower unit should be turned off at the unit, and then unplugged. The bounce unit becomes very slippery and dangerous when wet. Once the rain stops, plug the blower unit back in and turn it on. You can wait for the unit to dry or dry it with towels. Once dry, the bouncer should be once again safe to use. **Please call us at ( (281) 442-0907 if you have weather related questions once your unit has been set up. No refunds will be given once the inflatable has been setup and the equipment contract signed. Yes, our units can be set up inside or outside! You will need to have enough ceiling height (about 15ft to 20ft) to accommodate the inflatable. The inflatable must not be set up too near hot lights, a/c vents, or any fire hazard. Many commercial halls, malls, gyms, etc. will do just fine. WHY CAN’T I PICK UP THE INFLATABLE AND SET IT UP MYSELF TO CUT COSTS? Safety is our number one concern. Some companies will allow the customer to pick up & set up the units, we do not feel that is a safe idea. We personally set up and pick up every rental. The set up area will be evaluated, the correct size, type, and length of power cord will be used and they make sure all of the connections are correctly made. We will use the proper straps, stakes, tie downs, and anchors to secure the inflatable to the ground and ensure its safe operation. Also, each unit is rather large and weighs in excess of 220 pounds, so your safety in transport of these items is also our concern. 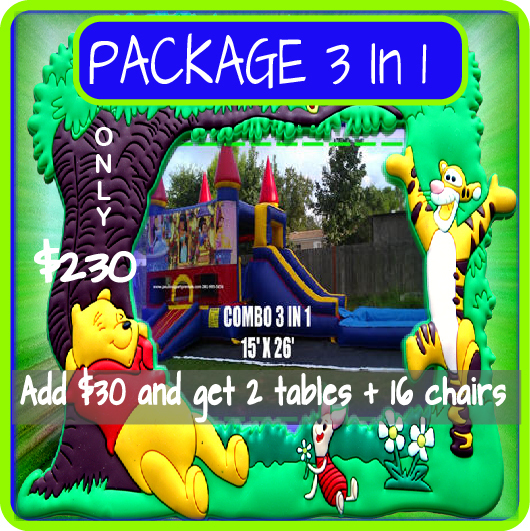 Our inflatables are constructed with quality and safety in mind! All of our units have a safety entrance/exit ramp for the children’s protection. Each unit is constructed of only the very best commercial grade 18 to 21 oz. vinyl, with double and quadruple stitching. All of the materials are fire retardant. The windows of the bounces are made of specially designed mesh netting, which allows for easy viewing and minimizes the chances of getting entangled. We will also supply recommended guidelines for safe use and recommended number of children allowed in the inflatable at any one time. Beware of cheap, unsafe, imitation inflatables! For your convenience, we accept cash. You may make a reservation over the phone Monday-Friday 10:00 AM – 8:00 PM and Saturday – Sunday from 9:00 AM – 6:00 PM. Our drivers most times leave as early as 7 AM to start on a route, and we may not be able to accommodate time sensitive orders placed only a day in advance that are not confirmed. We will always check our orders in the morning, but we will not deliver until we first speak with someone to confirm that you didn’t already find another company after placing a reservation with us. We hope this helps you make a smart decision to reserve a party rental with our company. If you have any questions, feel free to call us or leave a message at (281) 442-0907 You may also send us a text message anytime to any of our phone numbers. 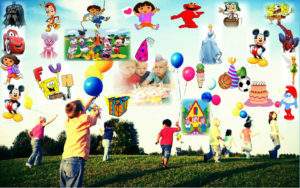 © 2012 Paulina’s Party Rentals. All rights reserved.